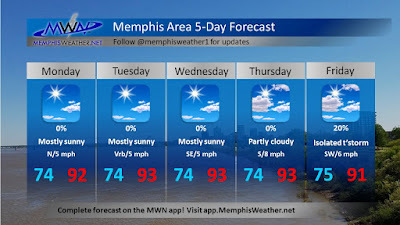 There really are no major weather talking points for the Mid-South region this upcoming week as our forecast will be primarily dominated by hot temperatures and not a whole lot in terms of precipitation. Unfortunately, there are parts of the U.S. that have been seeing historic amounts of rainfall lately. 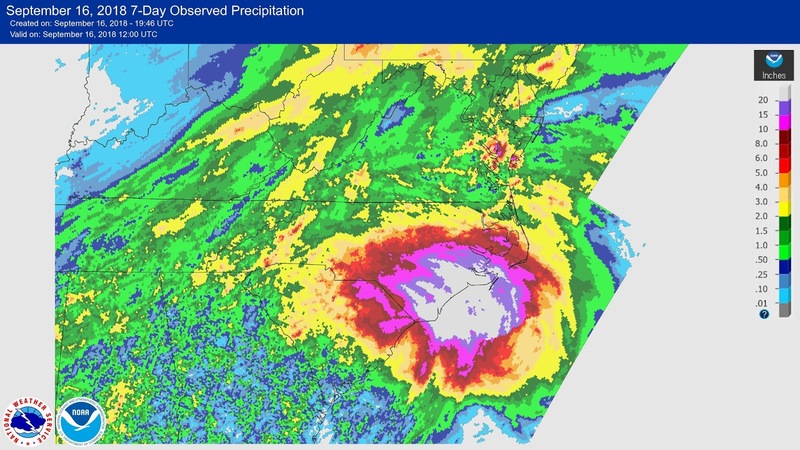 As we discussed in last week's blog, former Hurricane Florence eventually made landfall along the North Carolina coastline and has since brought catastrophic flooding to both North and South Carolina. Florence, now a tropical depression in wind strength, continues to bring bands of heavy rainfall to both states and has been doing so since last Thursday. Some areas have received over 30" of rainfall in this event alone. An additional crazy statistic from this event is that Wilmington, NC has already broken its annual rainfall record. The previous record, set in 1877, was 83.65 inches over the 12 month period. The area has already broken this record by reading 86.79 inches so far, and we still have three more months left in the year! Back to the Mid-South, expecting for a generally quiet evening tonight as temps slowly begin to cool off after sunset. Additionally, clear skies overnight will help our temps to cool with lows expected to reach near 74 in the city and a bit cooler in the suburbs by early tomorrow morning. In general, the first several days of this week will be extremely similar with no major weather pattern variations. There will be plenty of sunshine to go around each day with mostly sunny skies expected to dominate our weather pattern. 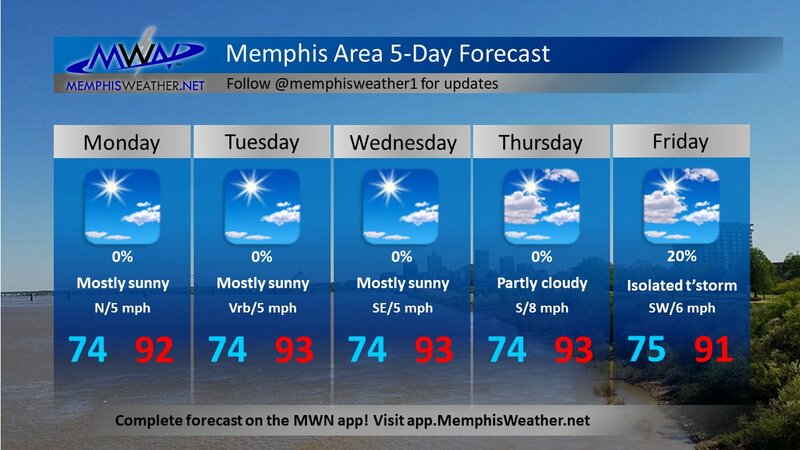 Highs each day will reach into the low 90s with tolerable humidity. We could even sneak into the mid 90s range on a day or two. Dewpoint temperatures will generally stay around 70, which isn't comfortable but isn't completely miserable either. The good news from this is that heat index values to go along with our highs in the 90s should near 100, but shouldn't go much over that. Nonetheless, it'll be toasty outside this week! For the evening and overnight hours, clear skies will help temps to cool each night with temps falling into the lower to mid 70s. The end of the work week appears to be the only day with a slight variation from the rest of the week. Overall, expecting for a similar weather pattern in terms of temperature with highs in the lower 90s and lows in the mid 70s. Our difference maker will be that rain chances will slowly begin to re-enter the forecast starting on Friday. A cold front will approach the Mid-South through the second half of the work week, but will slowly push into our area this weekend and eventually stall out. So what will this mean? We should eventually get a little relief from the heat we have experienced all of this week, but not as much relief as we all really want. We aren't expecting a washout for Friday; showers and thunderstorms will likely stay scattered at best. Overall this upcoming week looks to dip a little back into the summer-like category rather than fall-like, despite the autumnal equinox occurring on Saturday evening. Hopefully Mother Nature won't make us wait too long to finally get some of that fall weather we are all craving. Fingers crossed! In short, this upcoming weekend appears to keep the above average temperatures in place with a few additional rain chances becoming possible. To put things in perspective, "normal" high temps for mid-September are generally in the mid 80s with "normal" low temps in the mid 60s. We are expecting to be near 90 for our high this weekend with overnight lows in the lower 70s. These temps sound more like mid-August than mid-September if you ask me.